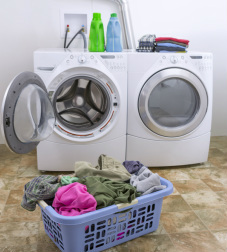 From high speeds front loads to steam cleaning today's washing machines are complicated machines that offer amazing features but can have numerous types of problems. Appliance Force Calgary’s licensed technicians have the professional training and expertise to diagnose your washing machine problem and fix it quickly and affordably. If you are experiencing any of these problems you can book appliance repair service by Appliance Force Calgary online now or by calling 403-770-9793. "Appliances are part of your everyday life. Trust us to make sure your everyday life runs smoothly." Regardless of the issue you may be experiencing, Appliance Force’s Calgary-based technicians have the training and parts to quickly repair your washer. We are trained to examine both the electrical and plumbing systems, and will look for things such as pump failure/blockage, motor malfunction, bearings/valve wear or control panel error. With a methodical examination of your machine, we will pinpoint the problem and provide you with a full diagnostic quote. Once we have answer your questions and received approval on the service quote, we will promptly repair your machine. Appliance Force uses flat service rates based on the Canadian Appliance Rate Guide, and we stick to our quotes, so you can be confident that you are paying a fair price for our expert service. Make sure the power is working properly and the breaker isn’t tripped. Try unplugging the washer for 15 minutes to reset it. 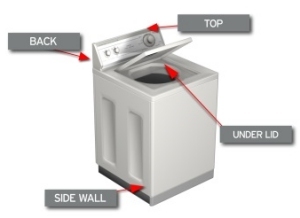 Look underneath the washer to ensure it is level. Has it shifted? Is there anything under the legs? Take a look inside – are there any loose pocket items that may be the source of the problem? If the machine has a pump drain filter access door, open it and carefully unscrew the cover and clean the filter, have a tray or towel to catch any water that may be inside. If you can’t identify the problem, give us a call. 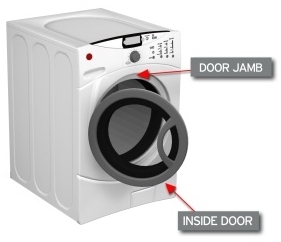 Make sure to have the model and serial number from your appliance so we can be prepared for your service. Our team of experts will identify and fix the problem at an affordable price. We are your first and best choice for Calgary appliance repair on all major washer brands, including Bosch, Kenmore, Whirlpool, GE and Maytag. Our technicians are specially manufacturer trained on these top-of-the-line machines. Our appliance service trucks carry most washing machine parts, so you can be confident the job will likely get done on the first visit. Trust us with your washing machine service – all parts and labour are guaranteed.